I love a good time travel story. There is a density of plotting required to make time travel work, and the concept itself invites cleverness, as paradox is almost guaranteed. It is a loaded premise. Time travel offers the audience a ticking time bomb that we want to explode in our faces. That said, Looper is not really a time travel story. Time travel is but the threshold of this dark and surprisingly mature film by Rian Johnson. What is surprising about its maturity is not that it comes from its director (who directed the critically-lauded Brick), but from a major studio film. This is not a wild romp à la Marty Mcfly’s Chuck Berry flavored blast in the past. This is gritty neo-noir. Set in a dilapidated Kansas metropolis in 2044, Looper follows Joe (Joseph Gordon-Levitt), a “looper,” a present-day executioner of his gang’s future enemies. Joe stands in a field outside the city and waits for a bagged and bound body to appear from thin air. He shoots it, collects the silver ingots strapped to its back, disposes of the body, and heads back to the city to party, exchanging his silver for Chinese currency and drugs. Why does the gang send its enemies back in time? In the year 2074 forensic science has made it almost impossible to get away with murder. Bodies can be tracked. Time travel is also illegal, so the only ones who use it are criminals. Put that way, the concept is not too complicated. The twist comes with a looper’s final contractual obligation. When the gang wants to close the loop, they send the future looper back in time with gold ingots instead of silver. This golden payout tells the present day looper that he has shot himself and has 30 years to live. When Joe comes face to face with his 2074 self (played by a grizzly Bruce Willis), he fails to make the kill. Old Joe escapes. The gang will do anything in its power to close a loop, as shown early in the movie in one horrifying scene. The results are not pretty for future or present parties, so Young Joe is motivated to hunt down Old Joe. Old Joe, of course, has his own plans. He’s trying to find a way to protect his future wife, and after 30 years on the wrong side of the law, he’s willing to do whatever it takes. It will take him to the limit of morality. This is not the movie the trailers make it out to be. The marketing department has focused on the action and time travel aspect of the film, with Gordon-Levitt and Willis shown together as reluctant comrades. In truth, Young and Old Joe have very different goals, very different stories, and spend most of the movie apart. 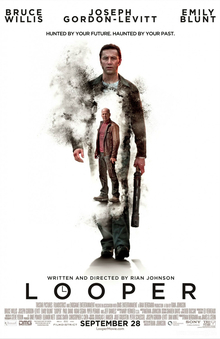 The marketing is a shame, as Looper has fun with its talented cast. Jeff Daniels is Abe, a gangster from the future sent back in time to recruit the loopers. His line delivery alone justifies his handful of scenes, and the relationship between he and a member of the gang, never explicitly stated to be his younger self, layers his role with a weary paternalism. The criminally underused Garret Dillahunt appears as the underutilized criminal Jesse. The two standouts are Emily Blunt as Sara and Pierce Gagnon as Cid, who underpin the movie’s second and third acts. Emily Blunt plays a strong young mother and shares great chemistry with Gordon-Levitt, possessed of a physicality rarely seen in Hollywood’s fixation with wispy women. Pierce Gagnon is precocious and threatening and also shares great moments with the leads. Looper really belongs to the three of them rather than Willis. And Willis’ emotional moments are limited to the second act. Beyond that he is reduced to cringing and shooting. To divulge more of the film’s plot would give too much away to the new viewer. A few twists are telegraphed early on but this movie should be seen fresh to enjoy the ride. What CGI exists in the movie is tastefully limited, giving the action real weight. Comparisons will be made to Ridley Scott’s Blade Runner but the the film’s most potent influence is Katsuhiro Otomo’s Akira. The widespread poverty and lawlessness of Kansas recalls Otomo’s Neo-Tokyo, both in its manga and anime incarnations. The roughshod nature of the vehicles and appliances, how the pervasiveness of urban Depression is portrayed incidentally, makes it real and thus the story an extension of a larger and more bitter skein. Another major plot development involving a child of uncanny perception owes more than a little to Otomo. There are also shades of Neal Stephenson’s Snow Crash in play. Unfortunately, the film does not leave the garage unscathed. There is much more that works in this film than does not, but it falters in a hurried third act and a resolution that is fittingly ambiguous but feels wrong. The film’s faults are mostly cosmetic. The makeup done on Joseph Gordon-Levitt is interesting, but ultimately distracting. This is, after all, a movie. We know that Gordon-Levitt and Willis are not the same person. And then there is the voiceover. Dune, Blade Runner and Dark City all had voiceovers forced upon them against their directors’ wishes in order to placate producers anxious that audiences would be lost. Yet without Harrison Ford’s sleepy monotone, Blade Runner casts a moody loneliness that is felt much better than it can be explained. Thus Looper’s voiceover bespeaks more egregious executive meddling, as all of the exposition it contains is covered in conversations that take place over the course of the film. For hard sci-fi fans worried about paradox, yes, there is paradox aplenty, especially by the tumultuous third act. The film makes it clear where its focus lies, and if it intended to hew to a strict set of rules Johnson seems competent enough to have done so. For those who like to split these hairs, I direct them elsewhere. A paradox-free time travel movie has already been made, 2007’s Los Cronocrímenes (Timecrimes), and it is as great as it is depressing. Primer (2004) is also great, but it will hurt your brain. It may be the smallest-budgeted time travel movie of all time and is also likely one of the hardest science fiction films around. But that is not Looper‘s game. At its core, Looper is a movie about fatherless children. It is a movie about wrong decisions and selfishness. In a way, this makes the inevitable paradoxes actually support the film’s time travel, as no character considers the consequences of their actions until it’s too late. Johnson wears his love of Dashiell Hammett on his sleeve, with rough characters intriguing and mostly gray. Even Young Joe’s final act, while a disappointment, is entirely true to his character, the consequences of which we as the audience cannot know for certain. For all that, it is the best kind of science fiction flick: clever and cool.